About Inventory Contact Hours Directions Testimonials In the News Chat Live Now! Martin L. Saper obituary here Read our Fall 2018 newsletter! 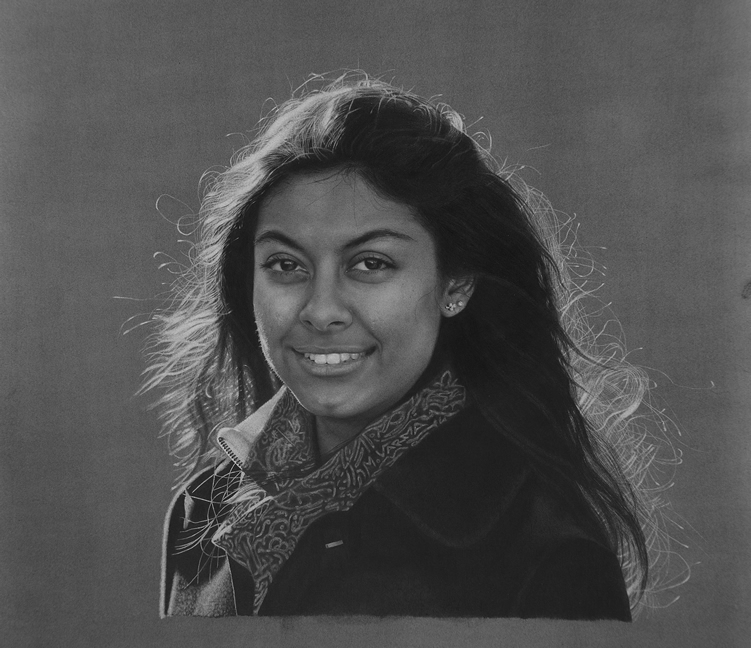 Mikio Watanabe is a master of one of the most challenging and difficult forms of print-making, the mezzotint etching. In celebration of our 40th anniversary, please visit and enjoy the mesmerizing mezzotints of Mikio Watanabe, now in our east gallery and online here. Gallery Photos of the Month are here. See a slide show of Saper Galleries here ! Fall 2018 Newsletter < New! Let us know if you would like to receive future newsletters! "Roy, you understate. This isn’t a newsletter, it’s a seminar! I look forward to seeing the works ‘in person.’ I was particularly taken with the Shiff; it almost floats off the canvas. ~ Annette"
"I love your newsletter Roy! Nice job! 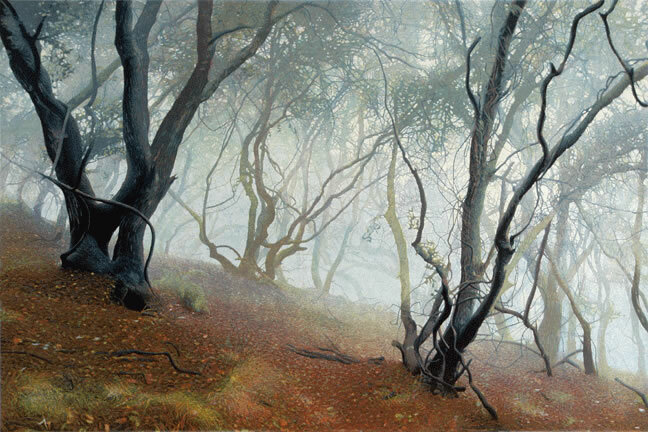 Litsa"
"Roy - Thank you for your newsletter- I always enjoy it- I’m fascinated with the paintings of the late Benjamin Shiff! - Kathy"
Gift Selections Under $100 here. 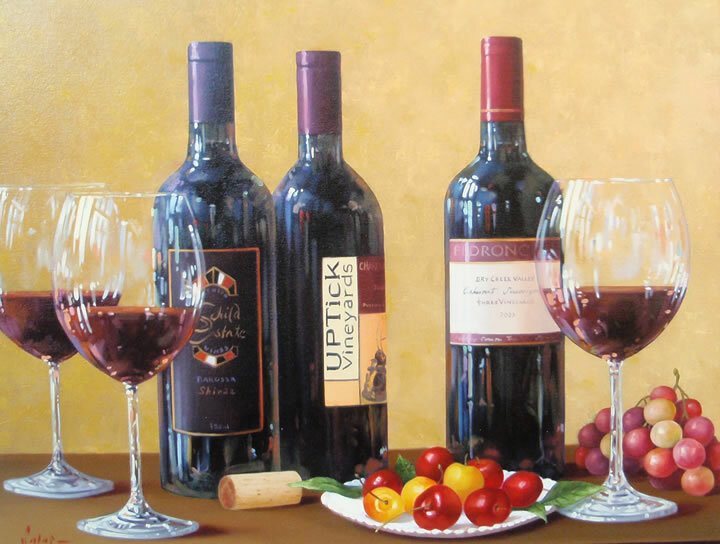 Saper Galleries also offers and can e-deliver personalized gift certificates in any amount! Enjoy this video about the visual arts here in Greater Lansing Michigan! Recent exhibitions are linked below! 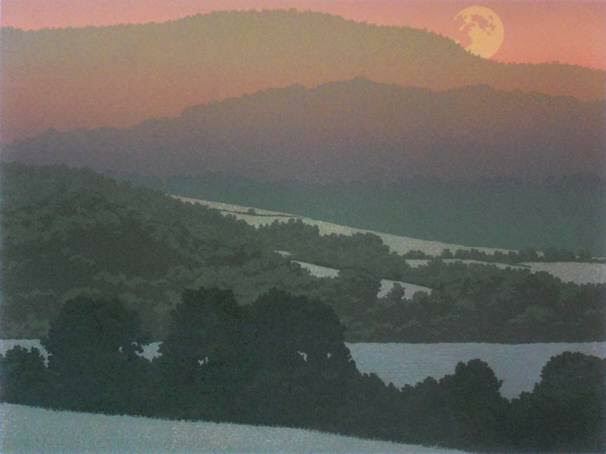 Landscapes as revisited and translated into linoleum block prints by Vermont artist William Hays. 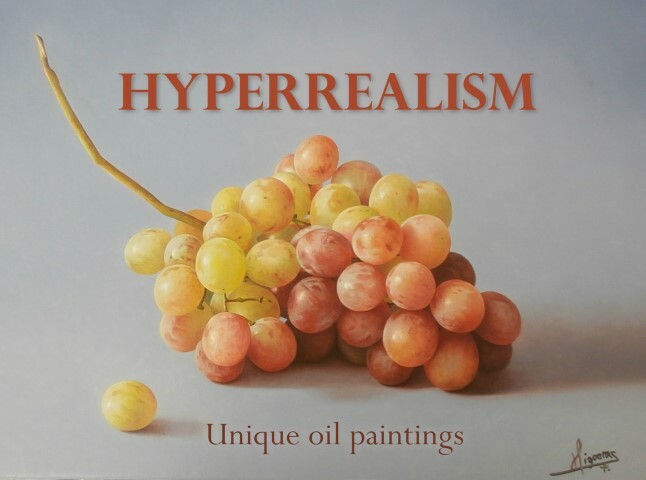 View the paintings of five artists who paint hyperrealism, a form of exacting realism that is so lifelike that the paintings have the illusion of being photographs, in part due to details that the eye would not normally observe in real life. Only the most highly competent painters possess the technical ability to so successfully achieve the results you will see on display now at Saper Galleries. Lansing City Pulse article about the exhibit is here. Dreamy impressions of Michigan places, real and imagined. Click here to see more images and learn more about the Michigan landscape oil paintings of Michael Callihan! 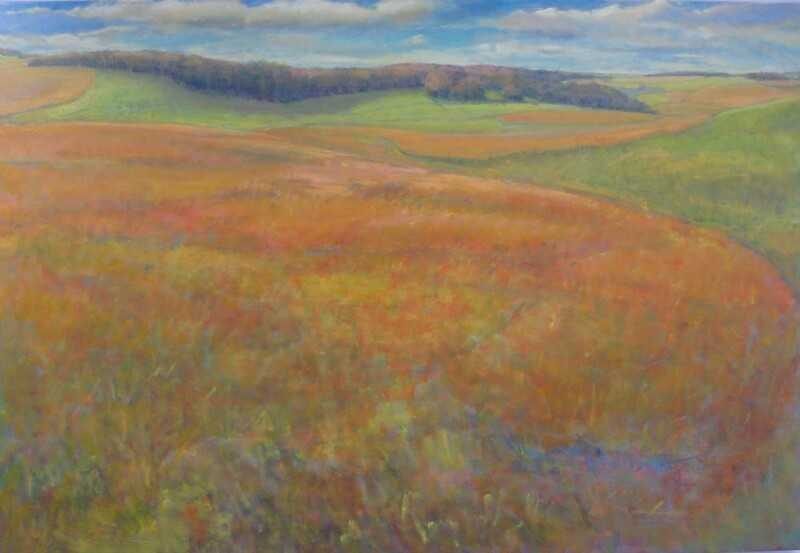 At this exhibition you will enjoy Lou Heiser's striking use of brilliant colors to depict what he observes from the lookouts, hills, rivers, dunes, fields, roads, and farm country in the northwestern area of Michigan's lower peninsula. Heiser's new paintings highlight Harbor Springs, Empire, Sleeping Bear Dunes, and Glen Arbor, among other areas. If you've wanted to light a sculpture or artwork on the wall but do not have a fixture installed, this is the light you've been waiting for. We love it! It is easily mountable on the ceiling or can beam light from below shining upward and is battery operated, controlled by a small remote control, and can vary the light intensity and color! Read more about it here and stop by to test it! 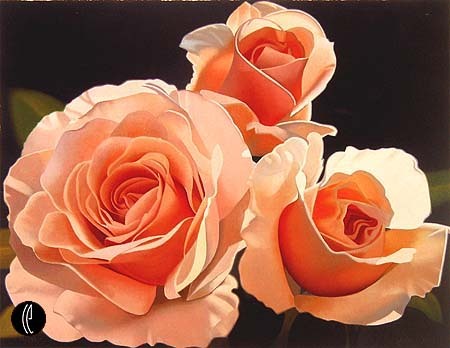 David Herzig is a highly regarded painter of botanical imagery from Toledo, Ohio. 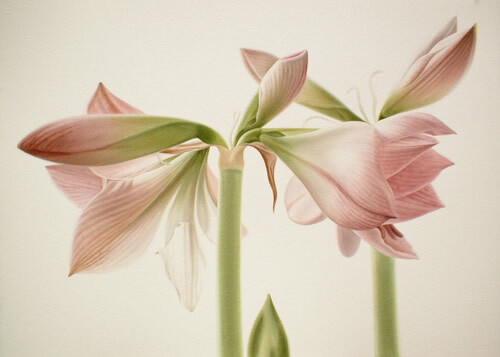 His watercolors and pencil drawings are of lilies, amaryllis, cyclamen, iris, orchids, and tulips selected from his garden. See the Herzig collection here! Colombian-born and now living in Spain, Juan Carlos Ortiz is a highly trained artist who demonstrates considerable talent and precise control in painting his canvases of exquisite still life and realism. See all of the Ortiz paintings here! Read Lansing City Pulse article here. A coupling of unique paintings and functional wooden boxes -- all in one! Most Martinez boxes are divided into sections for your pearls, rings, watches, notes, guitar picks, keys, precious letters, coins, lip balm, pens, flash drive, memory cards, buttons, pill containers, remote control, tea bags, stamps, batteries, ribbons and collections. 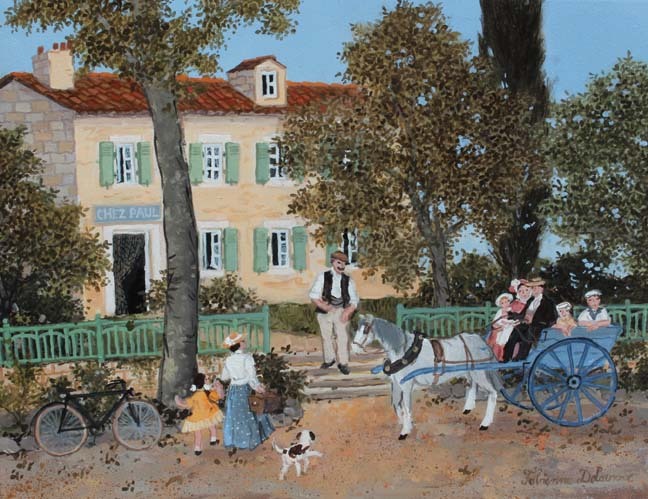 Fabienne Delacroix's lyrical canvases are windows on the past, that legendary era of memory and desire when life was sweet and pleasures innocent and simple. See the Fabienne Delacroix collection here! For more than 2,000 years, hand-blown glass has been made in Hebron, the largest city in the Palestinian West Bank. 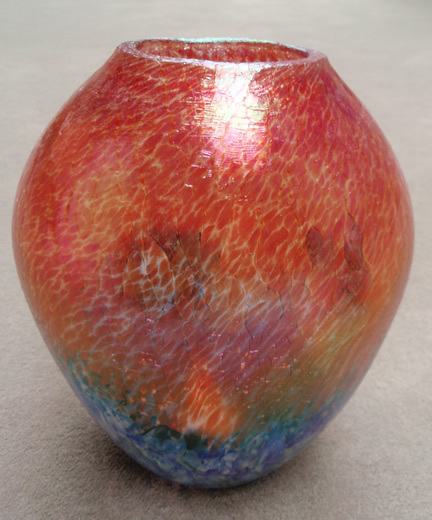 Rarely seen outside the Middle East, Saper Galleries has acquired these unique, swirl-colored hand-blown glass vases, now displayed in the center gallery. 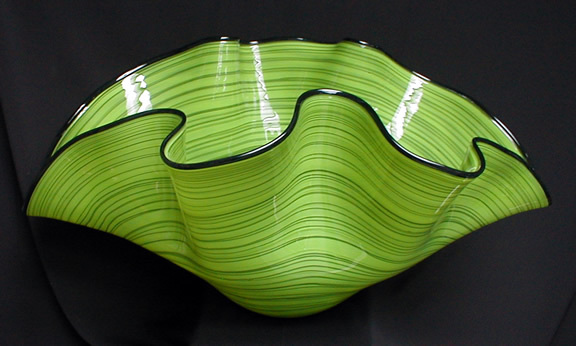 Click here to see the Hebron glass collection! 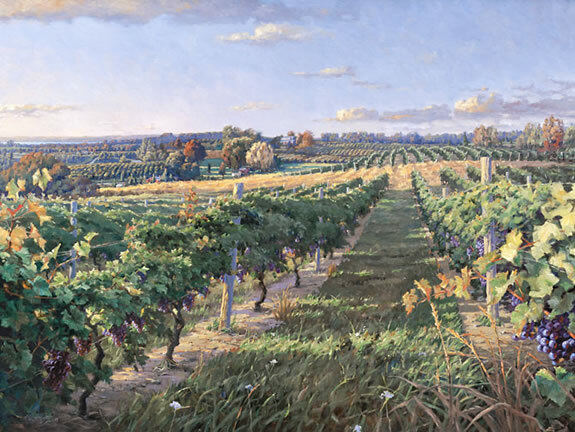 The splendors of Michigan are captured by the amazing talent of Michigan's premiere painter, Kathleen Chaney Fritz. 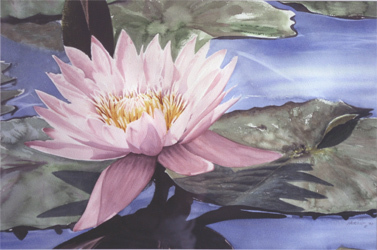 See her newest paintings and prints now on display! Here is what the Towne Courier reports. 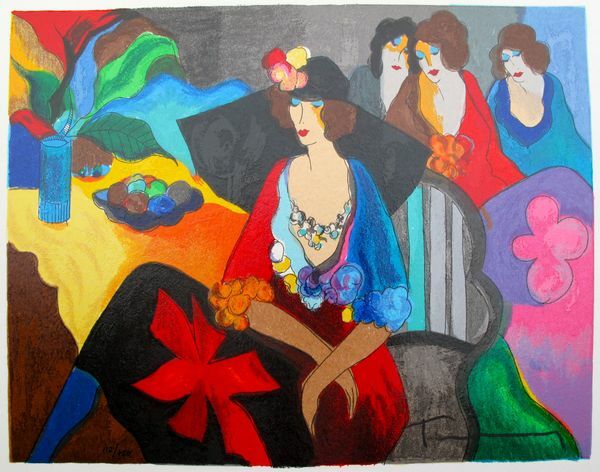 The Kathleen Chaney Fritz artworks are all on this page. 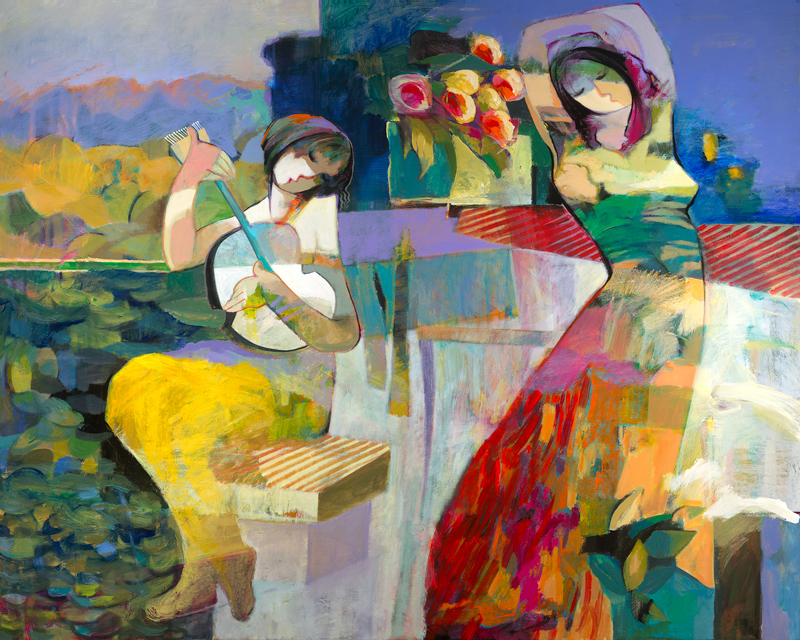 Colorful, emotive images by Persian-born Hessam Abrishami have been shown at Saper Galleries for 15 years. They are vibrant and filled with energy and expressions of love. See what Hessams are available here! Now in the north room of the west gallery! Oil paintings, watercolors, rare linocuts and lithographs by the Dutch-born artist who called Michigan home in the early 20th century. The entire Tunis Ponsen estate collection is managed and located at Saper Galleries. We would welcome your visit to see them. See the oil paintings here, watercolors here and lithographs here Costa Rican Cocobolo (Revisited)! Now in the center gallery! Unique, functional, boxes and bowls hand-crafted by artists in Costa Rica using their native rosewood-like cocobolo wood. 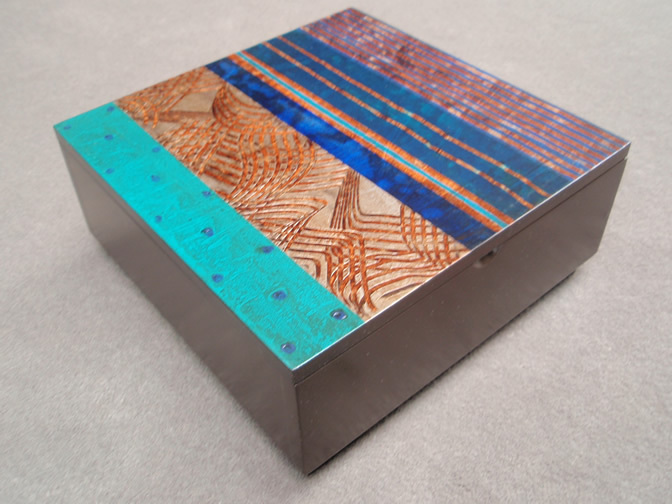 Hand-selected by us at the artist workshops for you to enjoy at Saper Galleries, the only source for these boxes outside of Central America. See the entire collection here and new cocobolo bowls just received here! Read what the Lansing State Journal writes about it here. 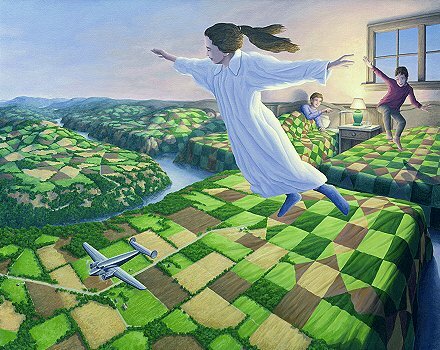 Enjoy the most recent images of Rob Gonsalves' Magic Realism. Discover the transitional imagery that bridges realistic scenes with the magic of creative imagination! The sculpted faces by Allen Littlefield are compelling, some with a nod to fantasy and many seemingly futuristic. Your own experiences determine what you see. 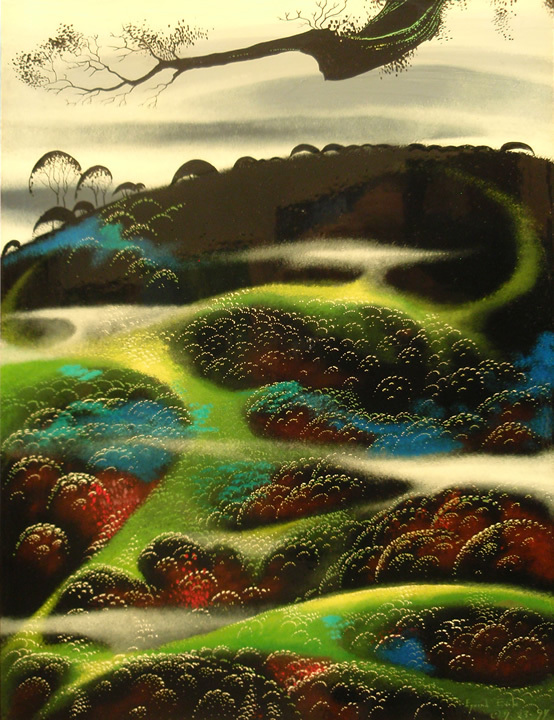 See the Lorax and images of other available Dr. Seuss artwork. You can own or give as a gift your favorite Dr. Seuss limited edition! 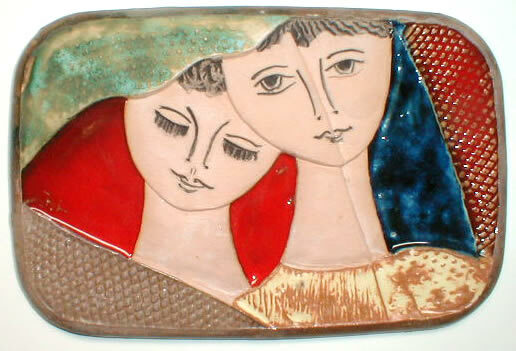 Visit and select from the world's largest collection of Israeli Ruth Faktor ceramics (starting at only $52). 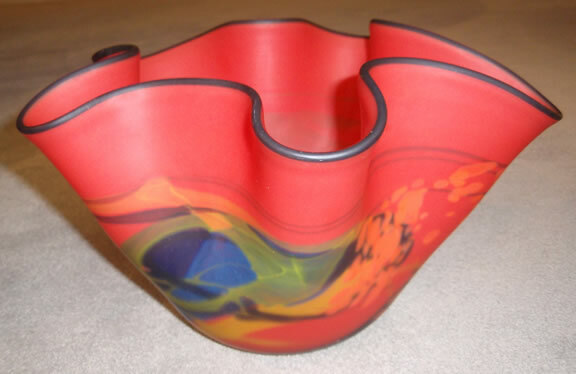 Click on the 13 links below to see the hand-blown glass on display now! New paintings by the British artist Hilary Eddy are of still lifes involving reflections and compelling floral close-ups of amazing detail and quality. 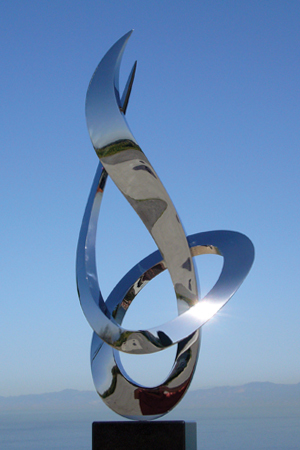 Polished stainless steel sculptures by James Russell, one of the world's most respected artists in monumental and indoor stainless steel sculpture, are for home and office, inside or out doors. Click here to see others now available! For Christmas, Chanukah, Mother's and Father's Day, Valentine's Day and other holidays, graduations, house warmings, thank yous, birthdays, anniversaries, weddings, showers, and for yourself! $20 Kathleen Chaney Fritz framed "minis"
Gift certificates in any amount! 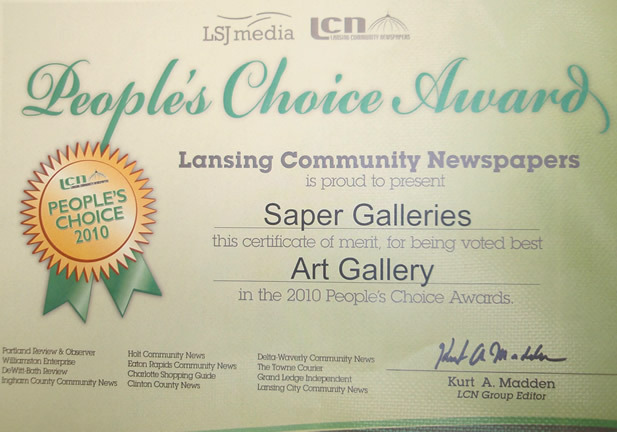 Readers of the Gannett paper in Holt, Michigan selected Saper Galleries as their favorite art gallery June 30, 2013 as part of the People's Choice Awards. Thank you to our many clients, friends, and visitors from Holt! 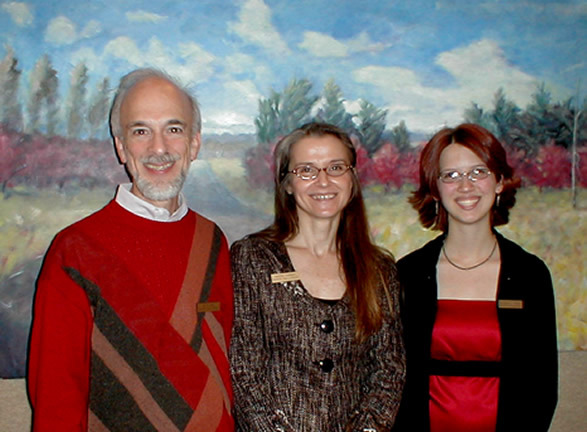 Gallery owner Roy Saper was presented a Citation for Community Service, by the East Lansing, Michigan City Council February 19, 2013, for his 16 years serving the City of East Lansing, Michigan's Art Selection Panel "with extraordinary merit". 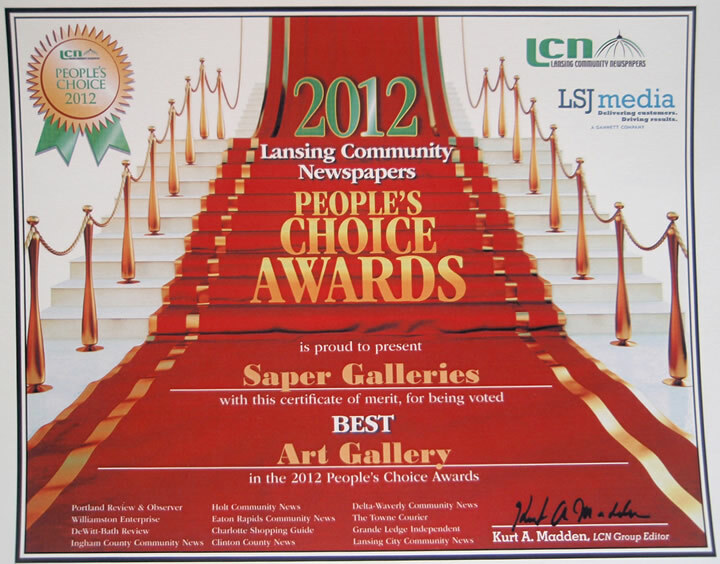 Saper Galleries received notice in September, 2012 of being awarded the 2012 Best of East Lansing Award. "These are local companies that enhance the positive image of small business through service to their customers and our community. These exceptional companies help make the East Lansing area a great place to live, work and play." On June 24, 2012, Saper Galleries was selected by readers of the Clinton County News and The Towne Courier and the Williamston Enterprise as the Best Art Gallery! Additionally, Williamston Enterprise readers voted Saper Galleries the Best for "Art Framing and Matting"! Thank you so much for the honor of recognizing us as your favorite gallery and picture framer year after year. We are deeply honored by the trust you place with us and are honored to be of service to you as we have for many thousands of client-friends since 1978. Saper Galleries was recognized on January 6, 2011 by America's Best and Top 10! 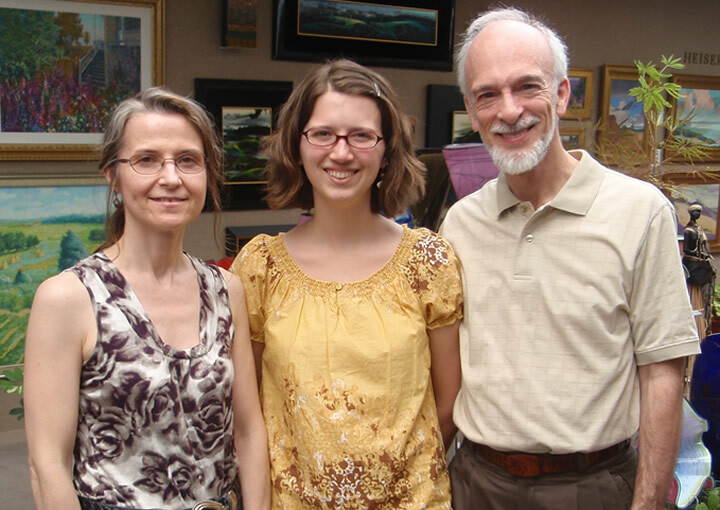 Their web site states that "The top-rated place in East Lansing is Saper Galleries in the Attractions category." We are honored to have received such recognition, particularly in that the community has so many outstanding attractions. 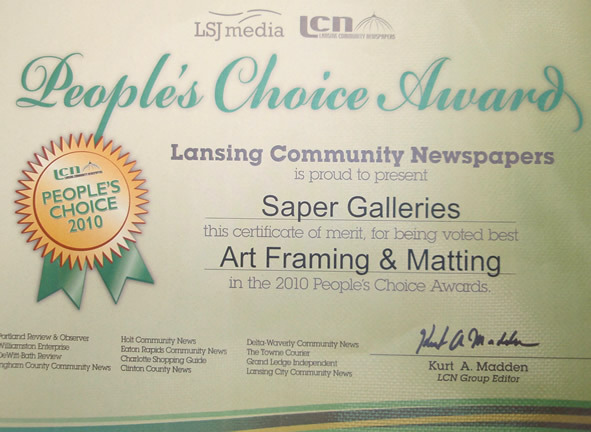 On July 23, 2010 we received certificates from the Lansing Community Newspapers congratulating us for being voted the Best Art Gallery and also the Best Picture Framers in the area. We are honored -- with thanks and appreciation! Thank you to readers of the Williamston Enterprise which in the June 27, 2010 paper voted Saper Galleries the "Best for Art Framing and Matting" and also "Best Place to Go and Things to Do" in the Art Gallery category! We appreciate and value your visits and many years of support. Our many clients and friends in Williamston are the best! Click here to read the Professional Picture Framers Association's January publication cover story on Saper Galleries. 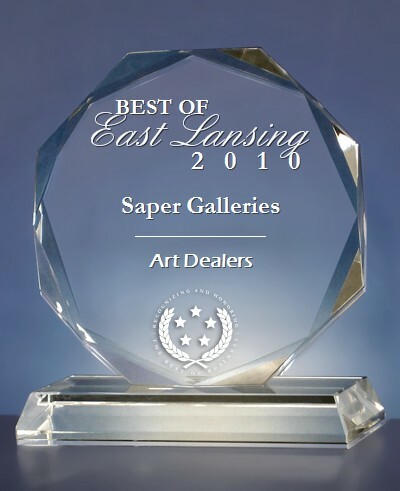 Saper Galleries was selected for the 2010 and 2009 Best of East Lansing Awards in the Art Dealers category by the U.S. Commerce Association (USCA). The USCA "Best of Local Business" Award Program recognizes outstanding local businesses throughout the country. Each year, the USCA identifies companies that they believe have achieved exceptional marketing success in their local community and business category. These are local companies that enhance the positive image of small business through service to their customers and community. Saper Galleries Won the 2009 National Award of Excellence -- the "Oscar" of art galleries for the best gallery event of 2008 as awarded by Art Business News. Read all about it here. Voted the Favorite Art Gallery in the 2009 People's Choice Award by Towne Courier readers (again). Although there are a couple dozen wonderful art galleries in the area, every year we are honored to have been selected by readers of the Towne Courier as their favorite. (See news article here.) Thank you to our many friends and clients who continually show their appreciation of what we do by recommending Saper Galleries for art and framing services. Know that we will never let you down and always give you all we can to ensure you have the best of experiences at Saper Galleries -- as we've delivered to thousands of satisfied customers since 1978. Have questions on any of the new items shown below? You can chat live with us now or send us an e-mail. 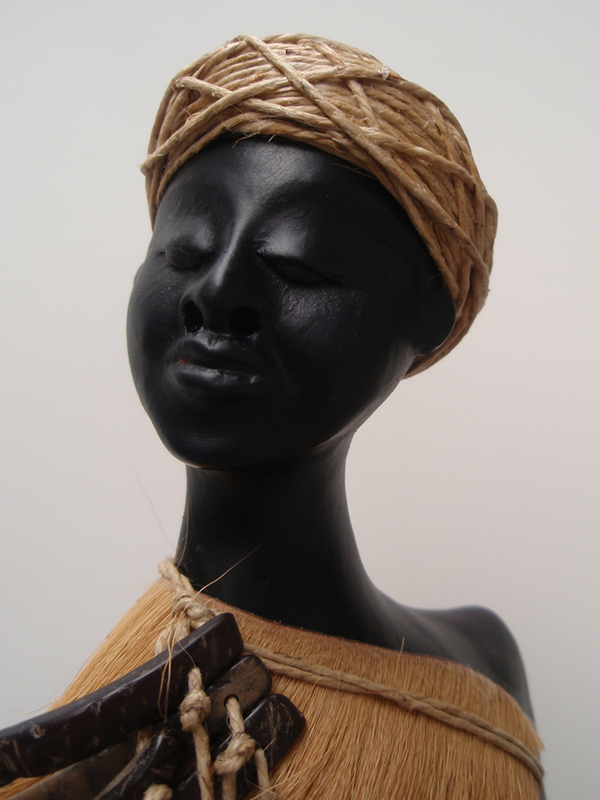 Recent Additions to the Saper Galleries Inventory! Gallery Photos of the Month! Click here to see past Photos of the Month from Saper Galleries! Delighted to have welcomed Michigan State University students from Laura Apol's teacher education class October 25, 2018. Each selected a work of art and will write a poem inspired by viewing the art. 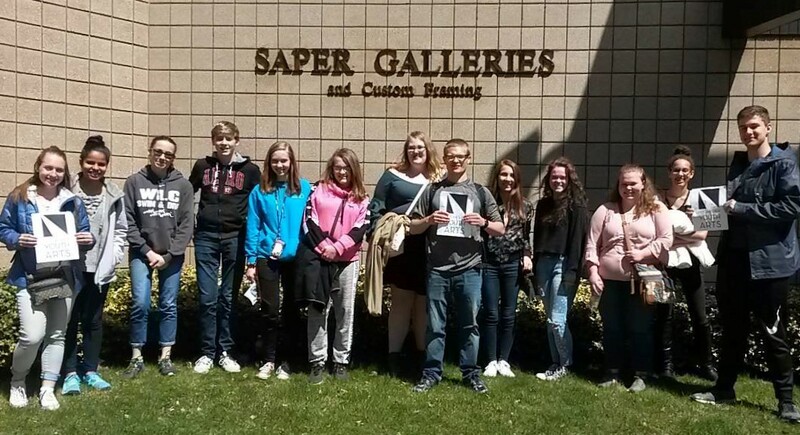 Michigan Youth Arts visited Saper Galleries for a discovery field trip in April 2018. For Lisa we cleaned, restored, and framed the painting her mother created about 50 years ago. What a beautiful memory. Click here to see more Photos of the Month from Saper Galleries! Every day the Saper Galleries web site is visited by art lovers and collectors from dozens of countries and we ship artwork regularly to those who acquire our artwork in locations throughout the world (as you can see from visiting our testimonials page). In August, 2009 Saper Galleries was awarded (by Art Business News) the national Award of Excellence for the best gallery exhibition (The Art of Dr. Seuss) in 2008. 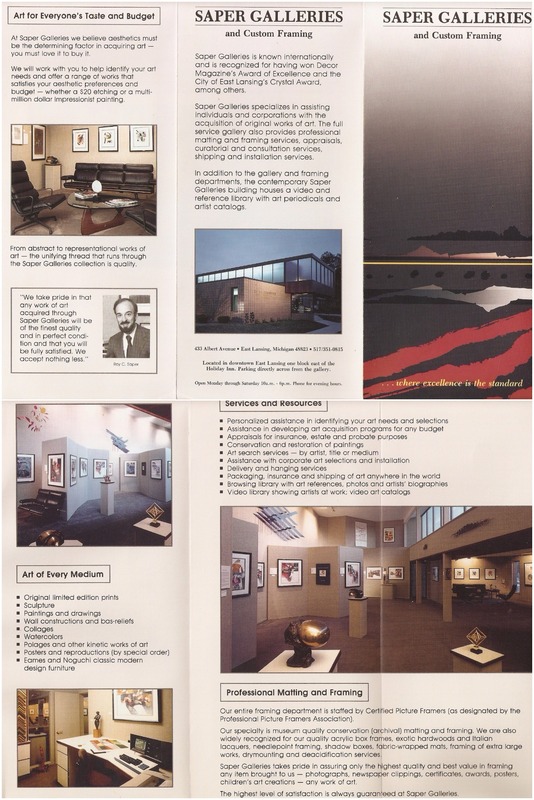 Two years earlier Decor Magazine presented its top award to Saper Galleries for our Picasso exhibition of 2006. In 2003 we were honored as one of the Top 100 galleries in the USA. Locally, in June, 2010 Williamston Enterprise readers and in June, 2011 and 2009 The Towne Courier readers voted Saper Galleries their Favorite Art Gallery and picture framer of the couple dozen in the area. 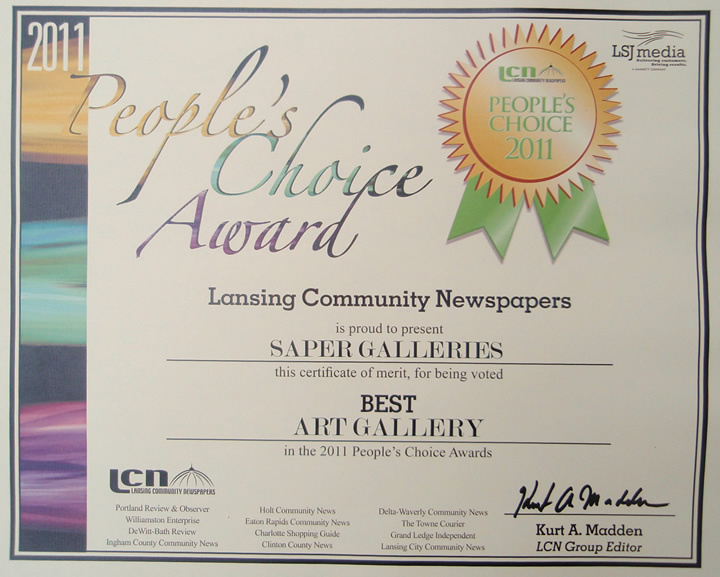 In May, 2008 Lansing City Pulse and, again, Towne Courier newspaper readers voted Saper Galleries as Best Art Gallery. 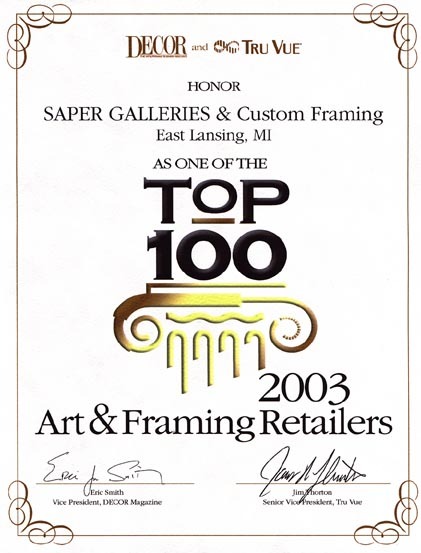 Saper Galleries and Custom Framing was honored to have again been voted the Best of the Best among art galleries in the 2007 Lansing State Journal readers' poll. Also in 2007 (as in prior years) Saper Galleries earned two "Best of the Best" awards from The Towne Courier newspaper -- for best art gallery and also for best picture framer. Similar awards were also earned in 2012 and 2013. Learn more about who we are, all that we do, and why Saper Galleries is different than any other gallery anywhere! Below are summaries of the 23 most recent exhibitions at Saper Galleries. 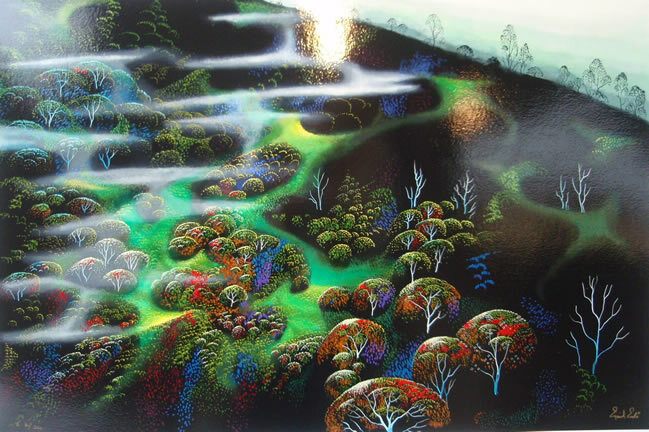 For a listing of all the major Saper Galleries exhibitions, click here. 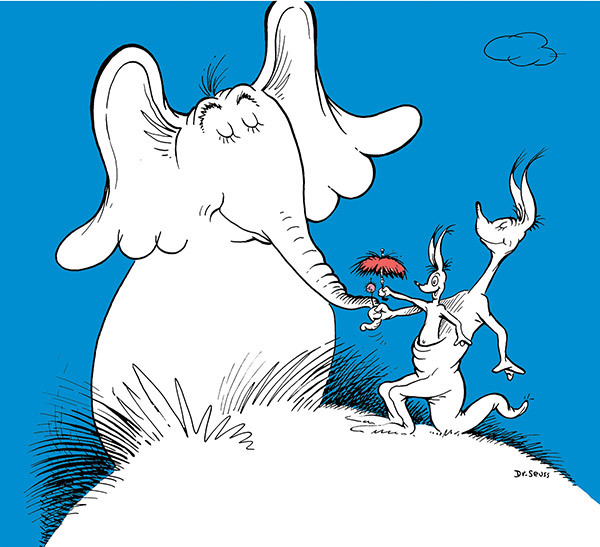 Dr. Seuss limited edition prints and sculptures were the focus of a major exhibition of the artist's work between 2008 and 2009. The display was recognized by Art Business News which awarded Saper Galleries the top exhibition gallery of the year award in late 2009. On display now is a selection of artwork from that exhibition including many of the illustrations used in the Seuss children's books, his secret art that was not published during his lifetime, and the unusual "unorthodox taxidermy". Click here to learn more! 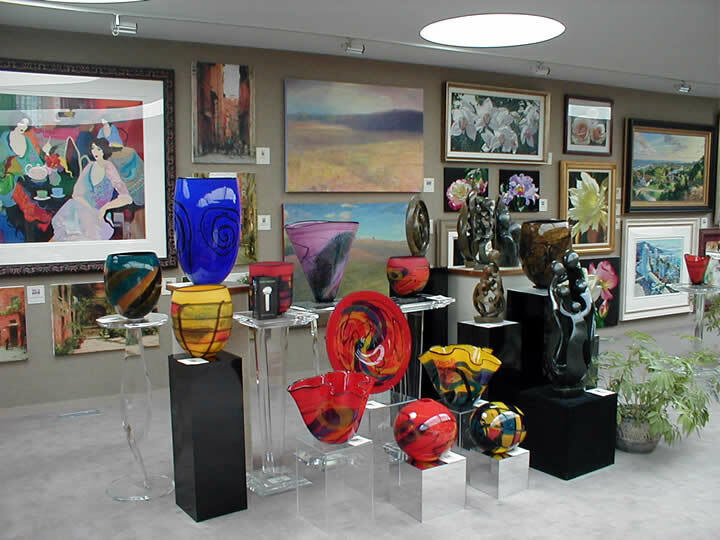 The hand-blown glass vases, bowls and paperweights of artist Robert Eickholt have been one of the most beautiful attractions of Saper Galleries over more than two decades. 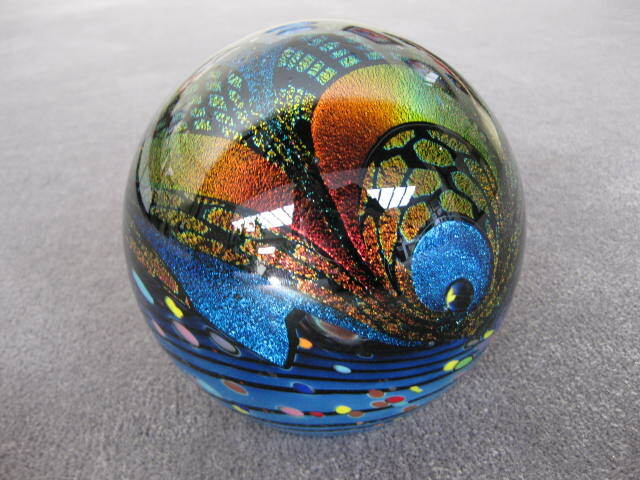 Since his retirement we have been displaying the last works he created, exquisite glass that evokes amazement at his superb talent in mastering the medium. 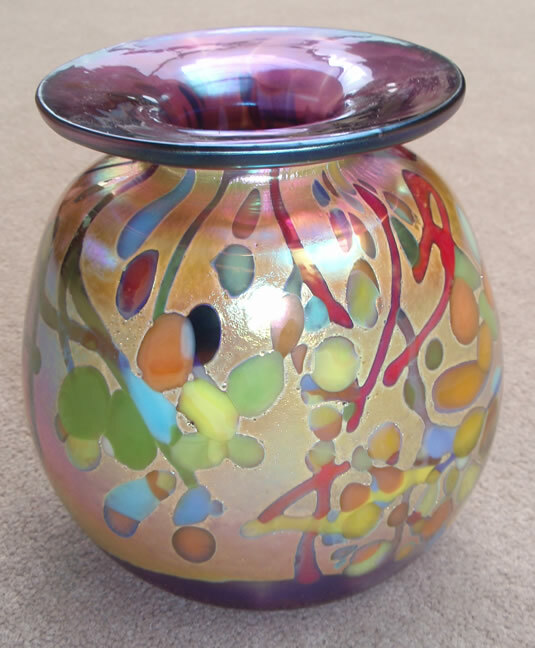 Click here to see the current inventory of the very desirable hand-blown glass of Robert Eickholt. Paul Braslow's cast bronze sculptures show life as he would like it to be -- graceful, elegant, and hopeful. They inevitably recall the work of Brancusi in their startling grace, and the work of Giacometti in their intensity. After first impressions, one reads the sculptures for their strength of balance, and only then the sense of emotion becomes apparent and remains the lasting impression. Saper Galleries is proud to make available to collectors the figurative, highly finished and unique cast bronze sculpture of Paul Braslow. 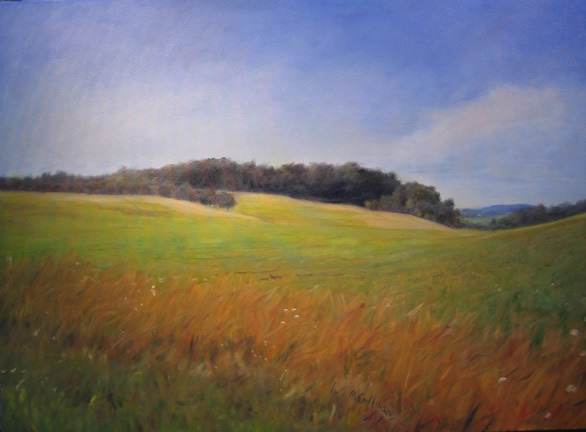 Michael Callihan's softly-focused Impressionist-like oil paintings are based on real and imagined landscapes around Michigan. 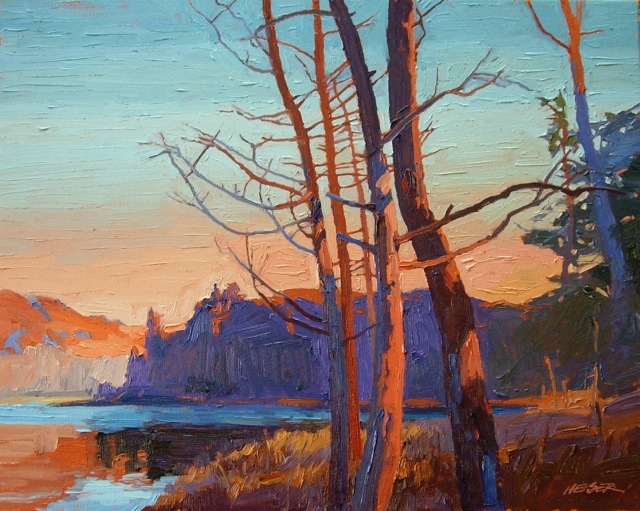 His paintings are reflective and peaceful and richly formed with depth and feeling. 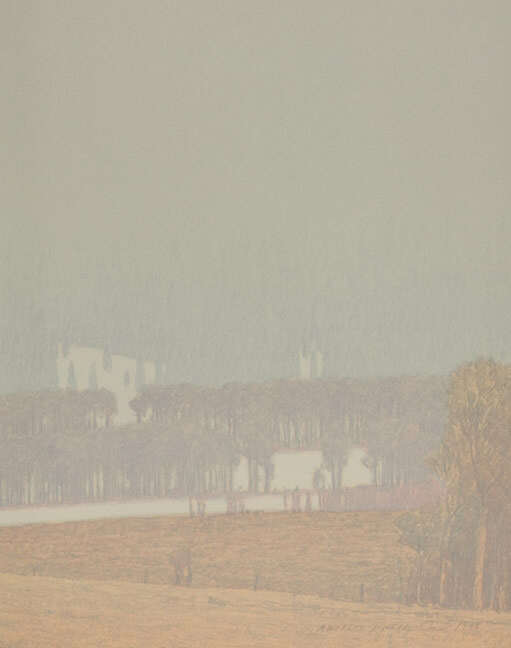 There is a connection to place in a Michael Callihan painting, like images of places you've visited, if not in person, at least certainly in desire. See the many paintings of Callihan's impressions here! 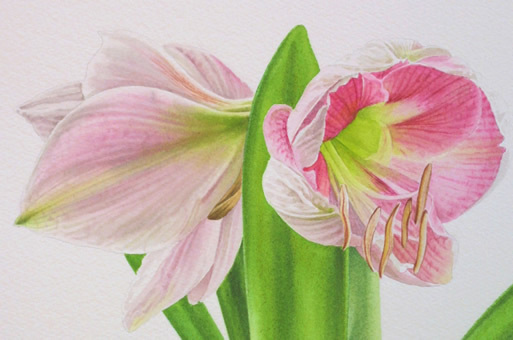 David Herzig's watercolors of familiar flowers are like poetic portraits. Enjoy his life-like paintings of tulips, lilies, amaryllis, poppies, sunflowers, iris and cyclamens. Many are now on display in the center gallery. Enjoy viewing them now here! 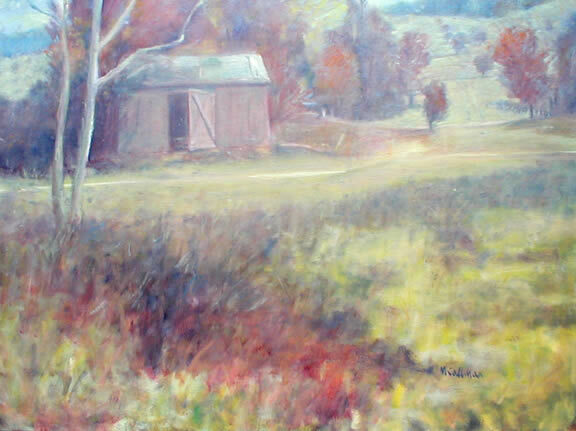 Kathleen Chaney Fritz is not only one of Michigan's best artists, she is also one of the best oil painters anywhere! 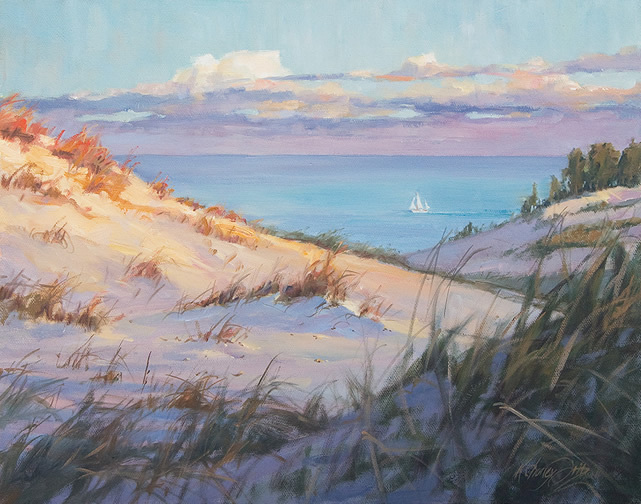 She beautifully captures the feeling of Michigan's many shoreline attractions and is also noted for her exquisite floral paintings. 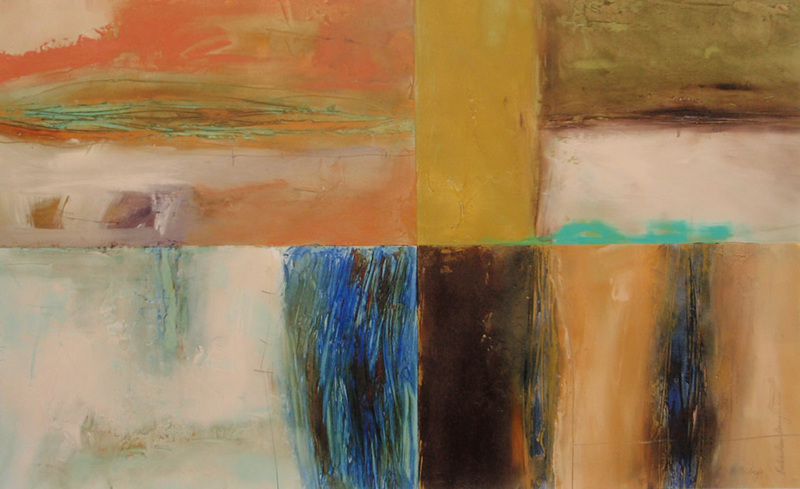 Saper Galleries is honored to be able to present for your enjoyment the rare and phenomenal quality paintings of Michigan artist Kathleen Chaney Fritz. See more here! 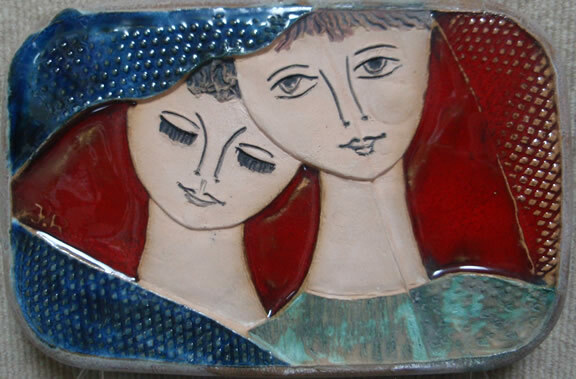 Ruth Faktor's ceramic bas-reliefs are beautiful, colorful tiles that collectors both hang on the wall and display on small table-top easels. 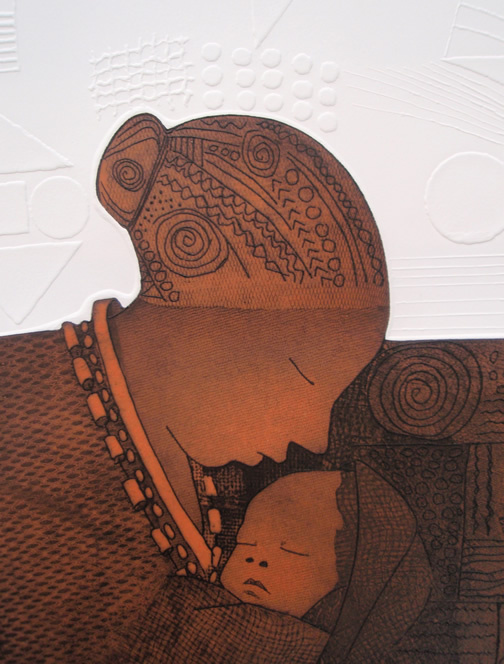 The images depicted in her solemn designs are of families, children, musical themes, and villages. 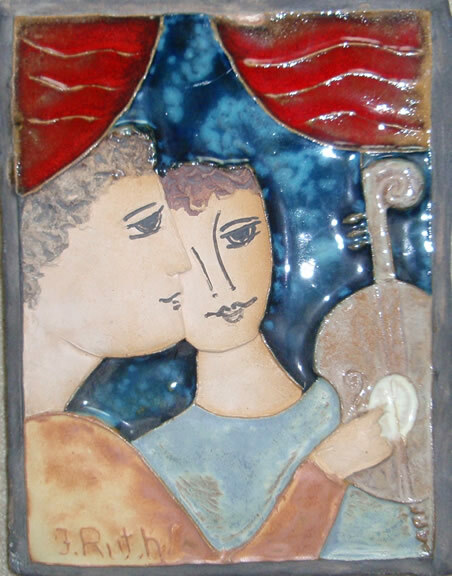 The Israeli artist uses clay from Jerusalem in creating these captivating works of art. To see the most recent additions to our vast Ruth Faktor inventory, click here or visit us in downtown East Lansing, Michigan! Pablo Picasso (1881-1973) is recognized as the most important artist world for his contributions to the world of modern art and for being the most prolific artist in the world. Saper Galleries displayed 77 original Picasso graphics and ceramics in a two- month exhibition ending July 9, 2006. 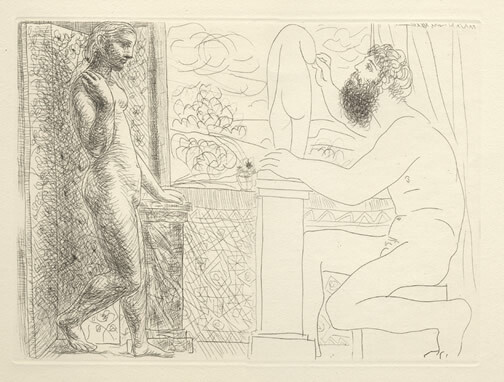 Although the exhibition has ended, you will enjoy reviewing the several web pages describing the exhibition, illustrating several of the Picassos which are still available, and providing detailed information about the women of Pablo Picasso, printmaking techniques, and historical and descriptive information about his art. All this and more can be found by clicking here. Do let us know should there be specific Picassos you are seeking for your own collection! 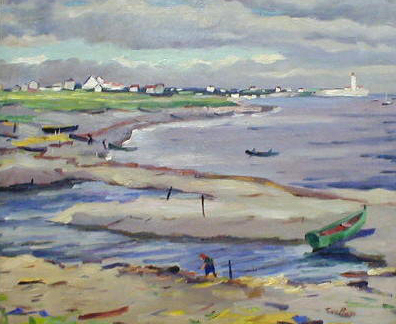 Dutch-born artist Tunis Ponsen (1891-1968) was a traditional painter who painted what he saw without embellishment. 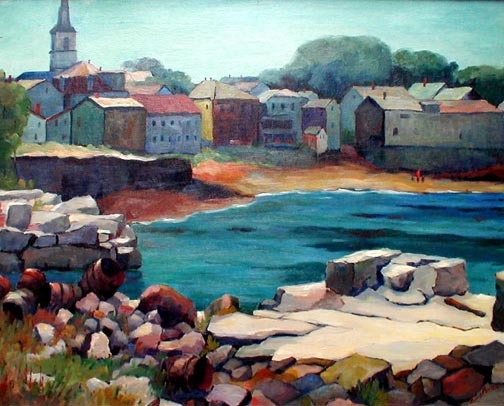 His imagery focused on the rural landscape of his western Michigan home and then urban scenes when he later moved to Chicago where he taught and exhibited frequently. Saper Galleries is proud to represent his estate paintings which numbered more than 1,000 oil paintings, watercolors, and a limited number of single-color lithographs and linocuts, all discovered soon after he died close to 40 years ago. 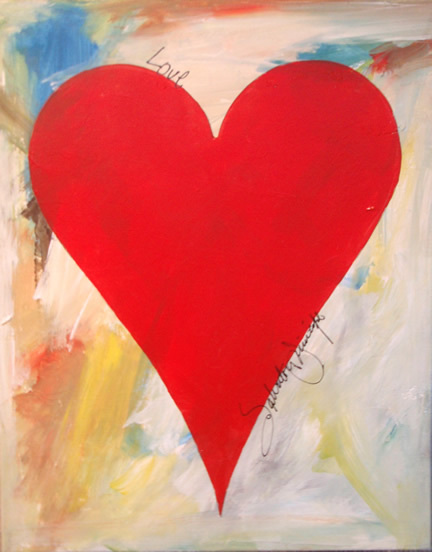 Click here to see more of his paintings that are in inventory now. 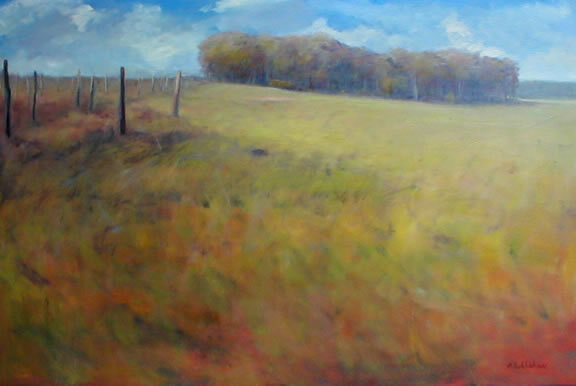 Michael Callihan's soft, tranquil Michigan landscapes convey a sense of quiet spirituality in a world which is strife with conflict and cacophony. On display the paintings become windows into a world of contemplated calm based on real or imagined places that artist Callihan has visited. The Michigan's artist's paintings never stay very long. Click here to see what is available today! 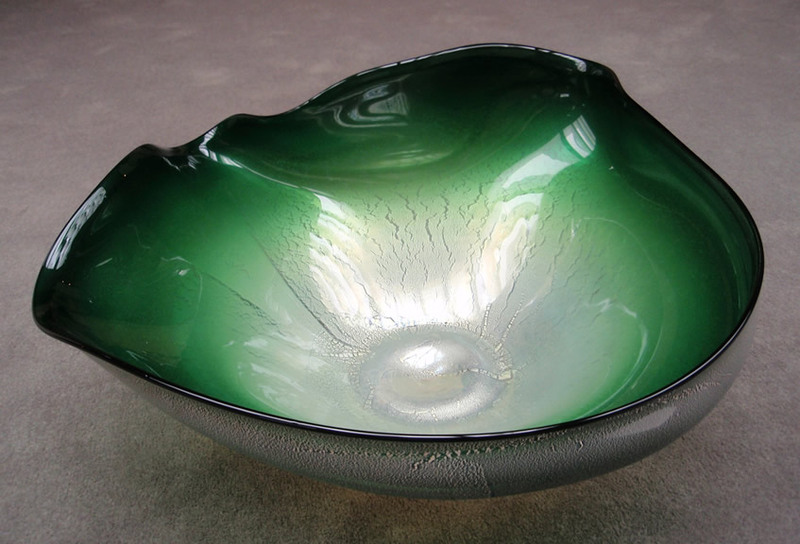 Ioan Nemtoi, the Romanian glass artist creates extraordinary, brilliant, decorative glass vessels. 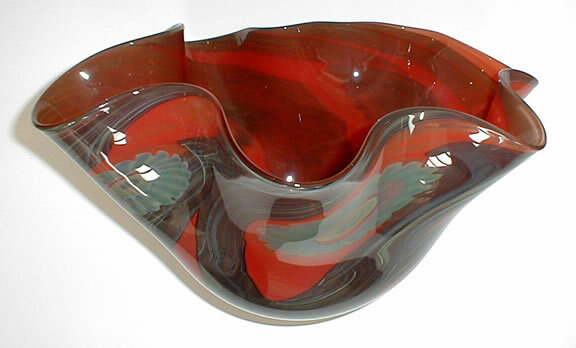 Their shapes and large size make them stand out considerably from that of other glass artists. 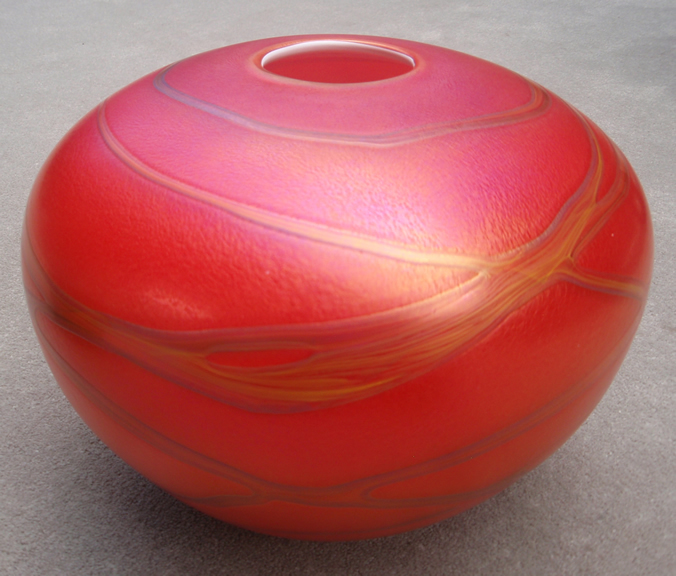 His hand-blown glass vases, bowls and other dimensional pieces are unique and compelling. Their unusual forms seem to dance, displaying a fluidity that represents the molten state that is now frozen into beautiful sculptures of captivating color and form. See more here. 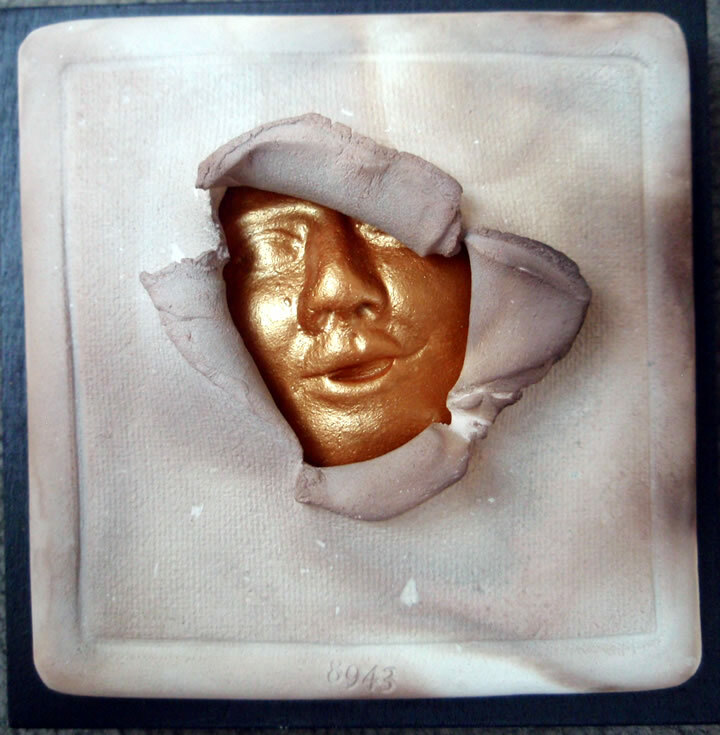 Bill Mack is a master of the sculptural relief medium. His low and high-relief figurative sculptures are captivating in evoking an emotional connection with the viewer. 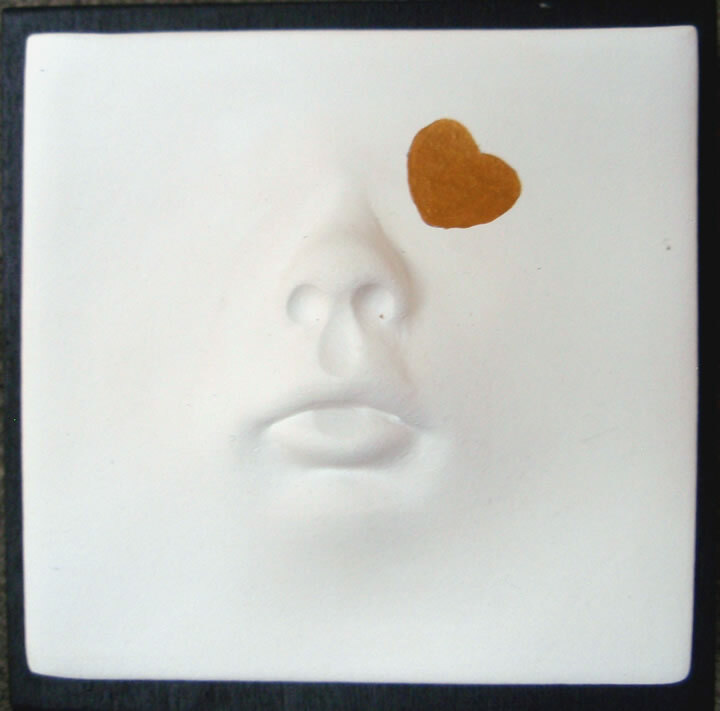 Click here to see additional examples of his cast relief figurative wall sculptures. 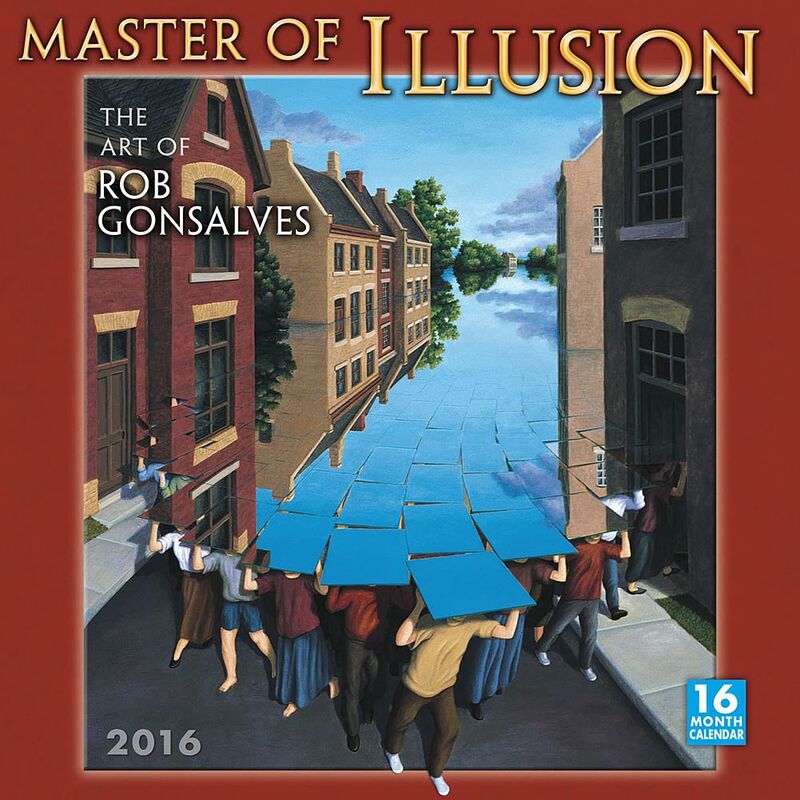 The Magic Realism of Rob Gonsalves continues to engage viewers who delight in the creative imagery of this one-of-a-kind artist! Take a ride to the land of fantasy and imagination by exploring the genius talent of Canadian artist Rob Gonsalves. We have in inventory a large selection of his Magic Realism as well as his recent books which illustrate his more popular imagery. See the entire collection here! 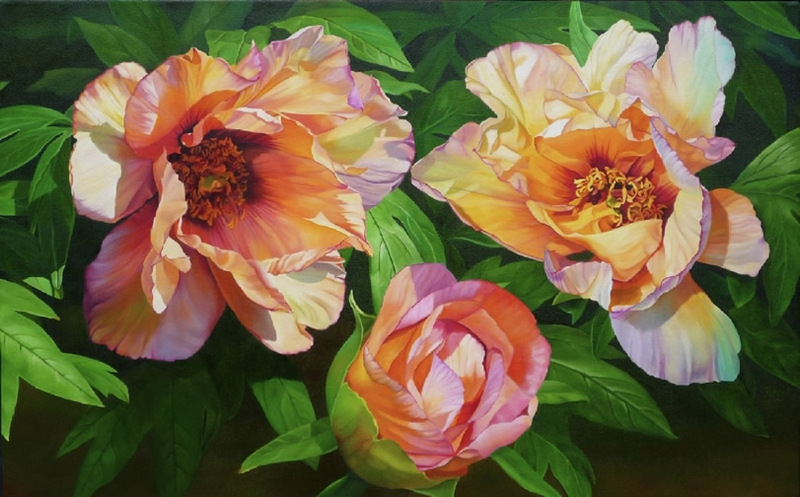 Brian Davis -- his magnificent, brilliant floral paintings beautifully capture the subtle shifts in color and shadows that we often take for granted when viewing the nature in our environment. 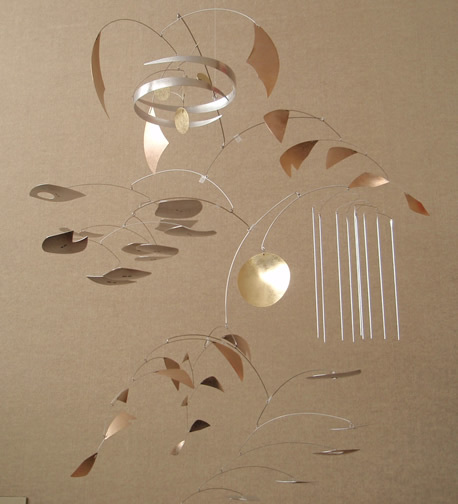 Davis brings attention to the beauty of nature by allowing light to dance about the image, allowing the breath and depth of the flower to seemingly come to life. 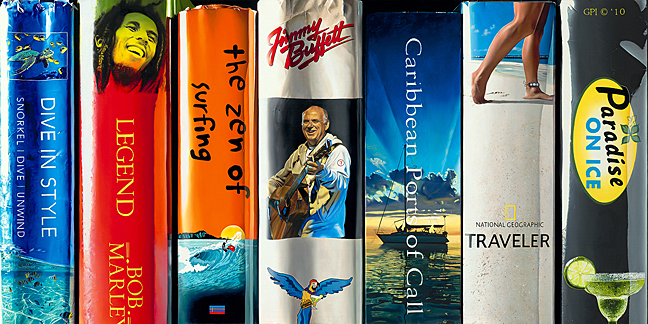 A wonderful selection of Brian Davis canvases are now on display at Saper Galleries! More images are shown here! 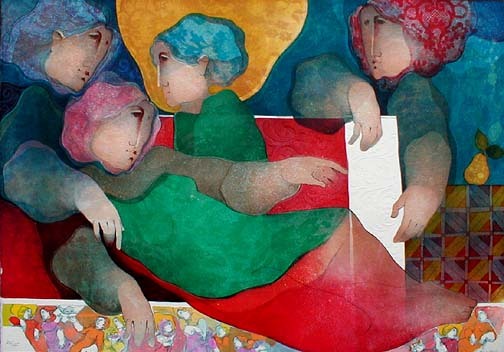 ALVAR , the famed Spanish painter who is known to collectors throughout the world for his colorful and poetic hand-colored embossed lithographs flew to Michigan from Spain to open the exhibition ALVAR: An Unveiling of Paintings, Watercolors, Drawings, Sculpture and Embossed Lithographs. The exhibition, which continued through December, 2003 displayed 50 works of art including his rarely-seen oil paintings, colorful watercolors, exquisite pencil drawings, cast bronze sculptures, and his most recent lithographs. To see Alvars available as of today, click here. A very limited number of Alvar books are also available. To see pictures of the opening reception click here! 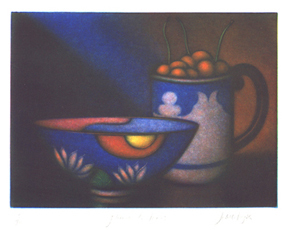 Laurent Schkolnyk, master of the mezzotint medium of engraving, was at Saper Galleries June 1, 2003 for the opening the the Saper Galleries 25th Anniversary exhibition. "Laurent Schkolnyk: Still Lifes by the Master of Mezzotint" featured 50 of Schkolnyk's exquisite, phenomenally-executed still life mezzotints. 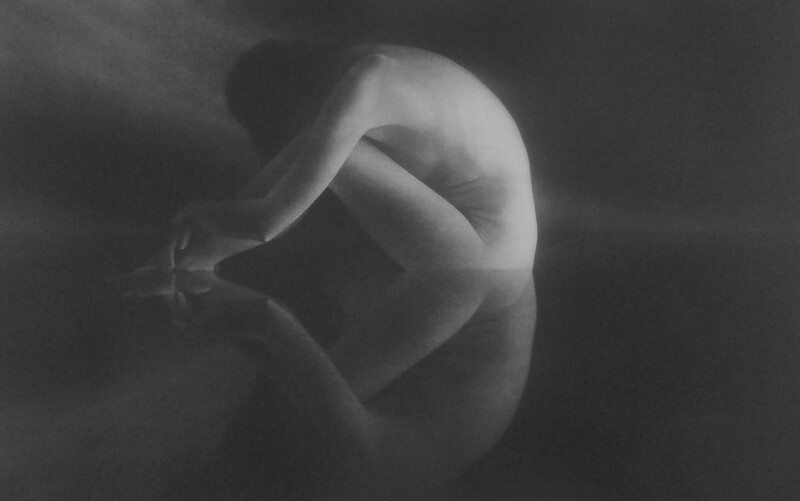 Schkolnyk, one of only 5 major mezzotint artists in the world, is recognized around the world for the delicate, glowing imagery of his ethereal designs. Please click here to see the Schkolnyk mezzotints now on display and available for acquisition. 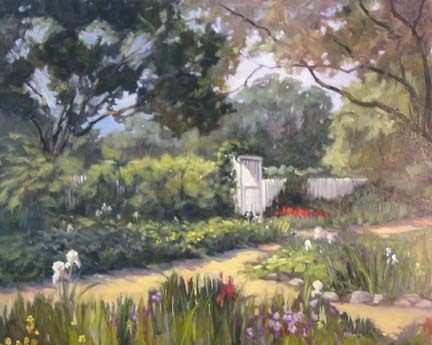 Barbara McCleary is a painter of vibrant florals, lush gardens, tranquil waters, and sun-swept landscapes. 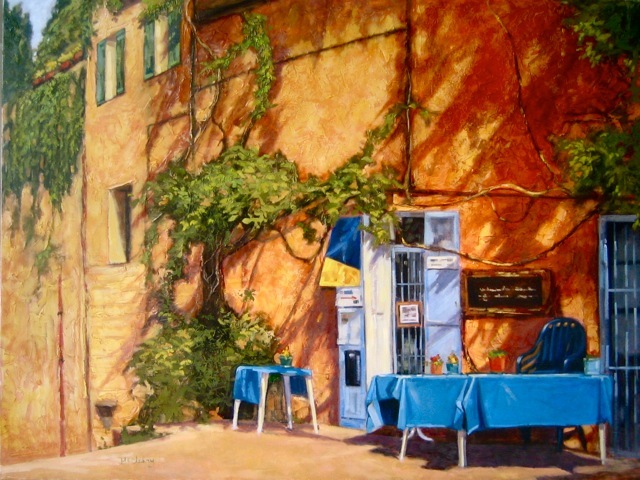 Visit Saper Galleries now to see a selection of her recent oil paintings influenced by trips to Provence, France, and Mexico. 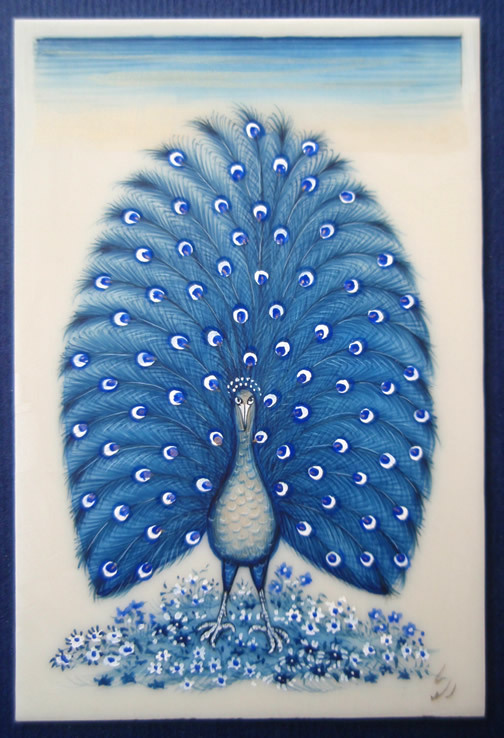 Click here to see an example of her beautiful paintingsand learn more of this extremely talented Michigan artist! We look forward to welcoming you to the vision of reality from the eye and brush of Barbara McCleary! 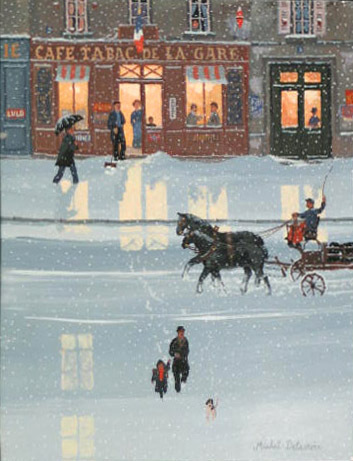 Michel Delacroix, the most noted naï f painter of our time, recently exhibited paintings of his native Paris at Saper Galleries. Several of his paintings and a selection of his limited edition graphics including the new serigraph "Moulin Rouge sous la Pluie" are still on display. 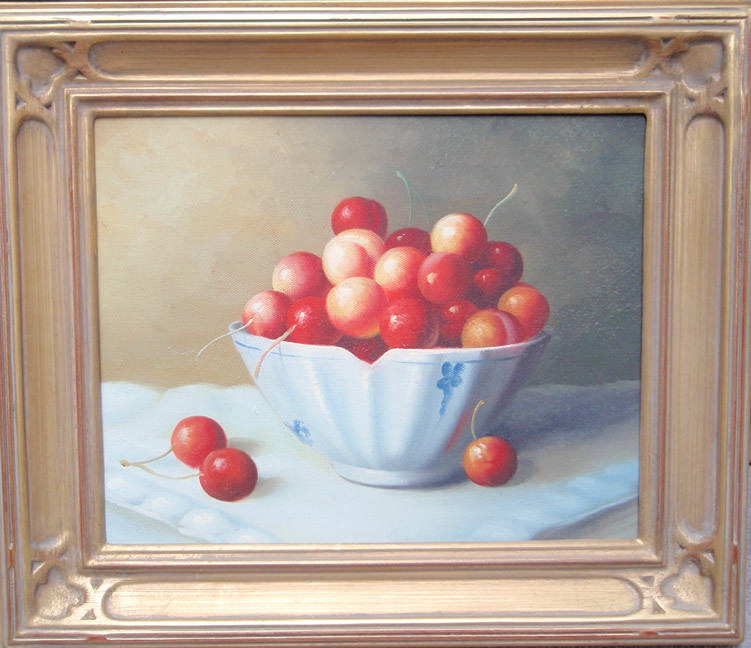 Stop by to visit or click here to see pictures of paintings available for immediate acquisition . We look forward to welcoming you! 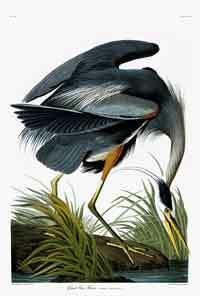 John James Audubon's "Fifty Best", recreations of 50 of Audubon's famous Birds of America hand-colored engravings from Chicago's Field Museum of Natural History opened October 7, 2001 and continued through December, 2001 at Saper Galleries. This world premiere of 50 of Audubon's best images from his famous Birds of America portfolio is still able to be viewed on line. You may order your Audubons by visiting Saper Galleries in person or contacting us on line now . To learn more about this special collection and see each of the images, please click here. 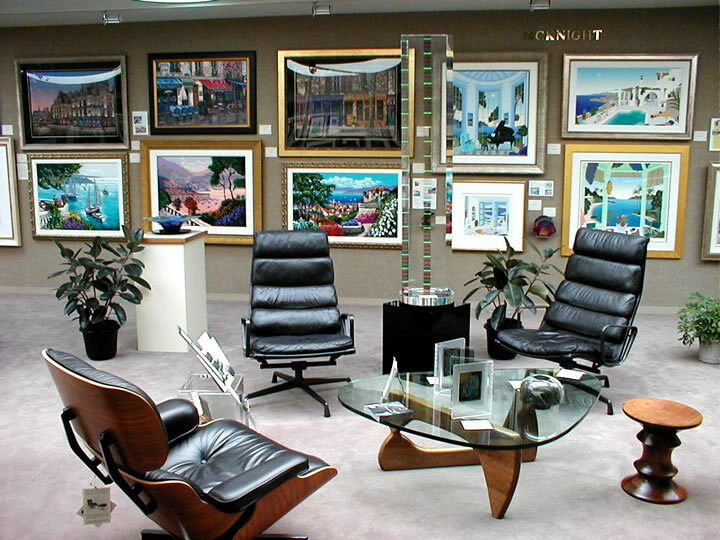 With a focus on quality and excellence you are guaranteed satisfaction at Saper Galleries! Two views of the west gallery, lit entirely by four large skylights, one 48-feet long!